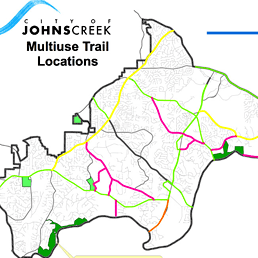 When the City of Johns Creek, Georgia was incorporated on December 1, 2006, it inherited a land use plan that was developed by Fulton County. The mayor and city council initiated a comprehensive planning effort that would include a new land use plan, transportation plan, and greenspace plan. Bill Drummond directed development of the greenspace plan, in coordination with the other two plans and the citizen’s advisory group. 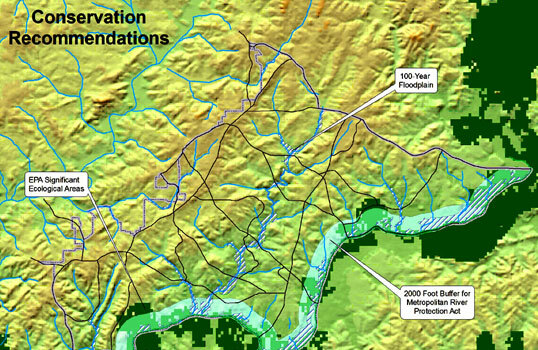 The greenspace plan focused on creation of new parks, greenways, and conservation areas. Part one of the plan was a community assessment that discovered that the City had less than three acres of parkland per 1,000 population, less than half of the adopted minimum standard. Part two was a community agenda shaped by the advisory committee, public meetings, and Internet input. The central goal of the community agenda was a doubling of public parkland. 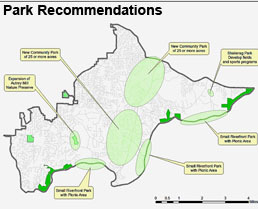 Part three, final recommendations, included GIS analysis of park accessibility and recommended creation of two new community parks in the central portion of the city, three small riverfront parks, and the expansion of two existing parks. The plan also recommended construction of a greenway network to take advantage of the city’s natural amenities.